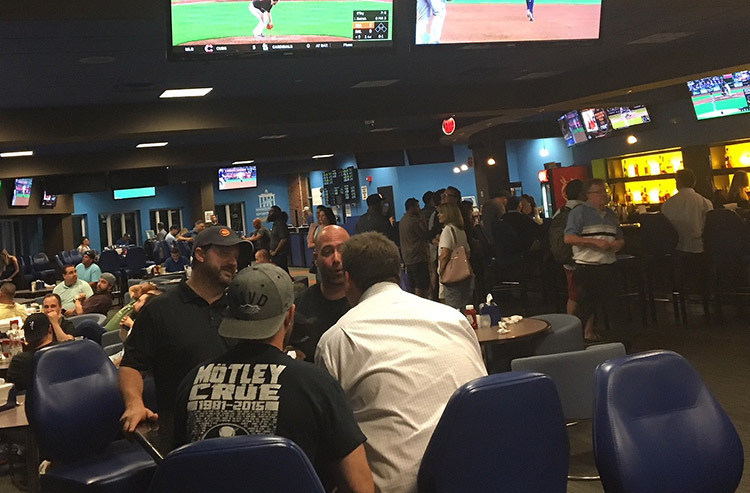 Sports bettors are enjoying the brand new William Hill sportsbook and bar at Monmouth Park in New Jersey. Ahead of Thursday morning’s official liftoff of sports betting in New Jersey, at the new William Hill US Sportsbook inside Monmouth Park, Dennis Drazin received an intriguing question. After a moment of reflection, the CEO of Darby Development – which operates Monmouth Park – then offered this observation. On top of that $3 million, there were considerable legal expenses in the years-long battle to get sports betting in the Garden State, before the aforementioned Supreme Court found in New Jersey’s favor on May 14. Indeed, on Friday night inside the very comfortable race and sports bar, patrons filled up practically every chair at the high-top and standard tables, as well as every seat at the bar. It wasn’t the craziness that marked Day 1, when literally several hundred bettors were lined up for the 10:30 a.m. debut. But it was a solid Friday night crowd, betting baseball games and all manner of other options on the board. This weekend should provide an even better barometer, because there’s live horse racing both days, to go along with a full plate of sports betting options. Oh, and of course, the recurring holiday on the second Sunday of every June. But a date at the end of summer also stands out for everyone involved: NFL Week 1 Sunday, on Sept. 9. Former state Sen. Ray Lesniak, who spent 40 years in the New Jersey Legislature and is widely credited as the driving force behind the legal sports betting effort, couldn’t contain himself as he thought about it. The brazen Drazin, however, was happy set at least a starting point for NFL Week 1, another weekend that will have live horse racing and in fact wraps up the Monmouth meet. “On an average Sunday, we get 10,000 just for racing and whatever event we have here,” Drazin said. “This is a unique culture, though. One example: We bring in food trucks, and we get 60,000 over three days. So if they’re coming for food trucks, don’t you think they’ll come out for sports betting?